ISLAMABAD (AP) — At least a dozen Islamic militants wearing police uniforms shot to death nine foreign tourists and one Pakistani before dawn Sunday as they were visiting one of the world’s highest mountains in a remote area of northern Pakistan that has been largely peaceful, officials said. The foreigners who were killed included five Ukrainians, three Chinese and one Russian, said Pakistani Interior Minister Chaudhry Nisar Ali Khan. One Chinese tourist was wounded in the attack and was rescued, he said. The local branch of the Taliban took responsibility for the killings, saying it was to avenge the death of a leader killed in a recent U.S. drone strike. The shooting was one of the worst attacks on foreigners in Pakistan in recent years and is likely to damage the country’s already struggling tourism industry. Pakistan’s mountainous north — considered until now relatively safe — is one of the main attractions in a country beset with insurgency and other political instability. The attack took place at the base camp of Nanga Parbat, the ninth highest mountain in the world at 8,126 meters (26,660 feet). Nanga Parbat is notoriously difficult to climb and is known as the “killer mountain” because of numerous mountaineering deaths in the past. It’s unclear if the tourists were planning to climb the mountain or were just visiting the base camp, which is located in the Gilgit-Baltistan region of Pakistan. The gunmen were wearing uniforms used by the Gilgit Scouts, a paramilitary police force that patrols the area, said the interior minister. The attackers abducted two local guides to find their way to the remote base camp. One of the guides was killed in the shooting, and the other has been detained and is being questioned, said Khan. Pakistani Taliban spokesman Ahsanullah Ahsan claimed responsibility for the attack, saying their Jundul Hafsa group carried out the shooting as retaliation for the death of the Taliban’s deputy leader, Waliur Rehman, in a U.S. drone attack on May 29. “By killing foreigners, we wanted to give a message to the world to play their role in bringing an end to the drone attacks,” Ahsan told The Associated Press by telephone from an undisclosed location. At least a dozen gunmen were involved in the attack, local police officer Jahangir Khan said. The attackers beat up the Pakistanis who were accompanying the tourists, took their money and tied them up, said a senior local government official. They checked the identities of the Pakistanis and shot to death one of them, possibly because he was a minority Shiite Muslim, said the official, speaking on condition of anonymity because he was not authorized to talk to reporters. Although Gilgit-Baltistan is a relatively peaceful area, it has experienced attacks by radical Sunni Muslims on Shiites in recent years. The attackers took the money and passports from the foreigners and then gunned them down, said the official. It’s unclear how the Chinese tourist who was rescued managed to avoid being killed. The base camp has basic wooden huts, but most tourists choose to sleep in their own tents. Local police chief Barkat Ali said they first learned of the attack when one of the local guides called the police station around 1 a.m. on Sunday. 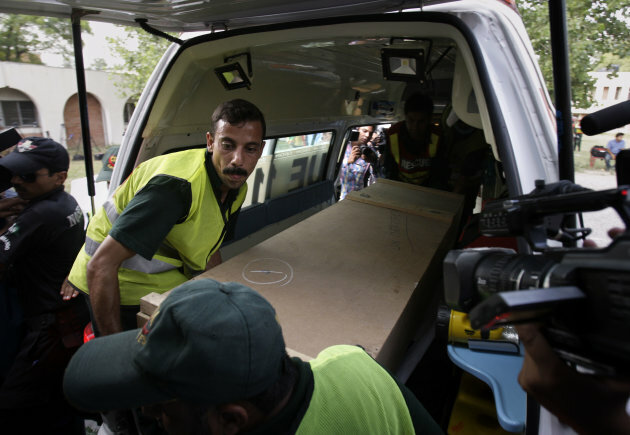 The military airlifted the bodies to Pakistan’s capital, Islamabad, Sunday afternoon. “We hope Pakistani authorities will do their best to find the culprits of this crime,” the Ukrainian ambassador to Pakistan, Volodymyr Lakomov, told reporters outside the hospital where the bodies were taken. The Pakistani government condemned the “brutal act of terrorism” in a statement sent to reporters. “Those who have committed this heinous crime seem to be attempting to disrupt the growing relations of Pakistan with China and other friendly countries,” said a statement issued by the Foreign Ministry. Pakistan has very close ties with neighboring China and is sensitive to any issue that could harm the relationship. Pakistani officials have reached out to representatives from China and Ukraine to convey their sympathies, the Foreign Ministry said. Many foreign tourists stay away from Pakistan because of the perceived danger of visiting a country that is home to a large number of Islamic militant groups, such as the Taliban and al-Qaida, which mostly reside in the northwest near the Afghan border. A relatively small number of intrepid foreigners visit Gilgit-Baltistan during the summer to marvel at the peaks of the Himalayan and Karakoram ranges, including K2, the second highest mountain in the world. Syed Mehdi Shah, the chief minister of Gilgit-Baltistan, condemned the attack and expressed fear that it would seriously damage the region’s tourism industry. The area has been cordoned off by police and paramilitary soldiers, and a military helicopter was searching the area, said Shah. “God willing we will find the perpetrators of this tragic incident,” said Shah. The government suspended the chief secretary and top police chief in Gilgit-Baltistan following the attack and ordered an inquiry into the incident, said Khan, the interior minister.